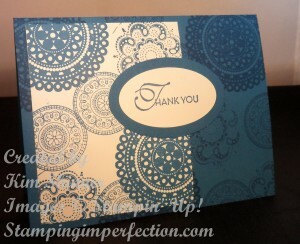 Exciting News and My January Customer Thank You Card! I’m so excited to share my news! I’ve been invited to join the Paper Craft Crew Design Team! I love designing cards and participating in sketch and color challenges so I’m very excited about this new venture! I hope to inspire you with my designs and I’m inviting you to participate in the weekly challenges along with me! I tried a new technique today that I wanted to share with you. It’s a monochromatic technique. The ink and the paper are all the same color. I actually really like this technique. It’s so simple and very quick to create a card. Some days you just don’t have the time to think about your color combinations or the patterns you will use. 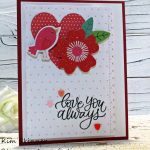 With this technique, you only need to pick the color, the stamp set and the sentiment! You can’t miss with this one. This card will be my January Customer Thank You Card! 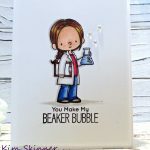 When you place an order with me, you get a handmade thank you card! I used Pacific Point ink and card stock. The stamp set is Lacy and Lovely. I used the new oval framelits for the sentiment. 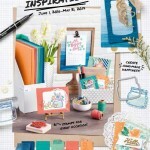 The new Spring Mini Catalog is live! That means you can order from it! If you don’t have a catalog, you can download it and check it out online by clicking here. Please email me your name and phone number if you need a catalog! You can email me at kim@stampingimperfection.com. It’s nice to be able to access the catalogs online, but it’s even better to have the catalog in your hands so that you can mark it up, fold over the pages and be inspired by the designs! I will send you a catalog and I will even pay the shipping! There are also some exciting specials for January! There are two exclusive Valentine’s Day stamp sets. Each with it’s own FREE bonus! and get a FREE package of package of 50 (fifty) 1″ x 8″ Cellophane Bags ($2.50 value)! 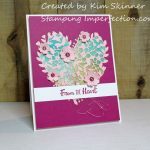 The Happy Valentine Heart single stamp was designed to coordinate with the Stampin’ Up! Full Heart Punch. (I just purchase this myself! Just in time for Valentine’s Day!) The Full Heart Punch is sold separately. The exclusive Valentine bundles each have a special item number. 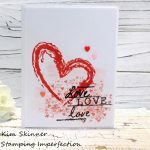 When you place the item number for the My Little Valentine stamp set in your shopping cart, the Sealed with Love Simply Sent Kit will automatically add itself into your order. Order your exclusive My Little Heart stamp set in my online store! Valentine Treat Bundle (Happy Valentine Heart single stamp with free 1″ x 8″ Cellophane Bags) # 132771. Order for only $5.95 in my online store!